Agalychnis callidryas (Cope, 1862) is a tree frog of the family Hylidae, widespread in Central America. It is known by the common name of the red-eyed tree frog. Many scientists believe that this frog has developed his big red-fire eyes to scare predators and get them to ask some questions about the quality of the meal that they are about to consume. These amphibians, rainforest icons, sleep during the day close to the stems of the leaves, with their eyes shut. If disturbed, they immediately expose their bulging red eyes and simultaneously show their huge orange webbed feet and their hips coloured by yellow and blue stripes. This technique designed to stun with colours, might linger a bird or a rattlesnake offering to the tree frog a valuable opportunity to get to safety with a leap. Maybe, the bright green of his body responds to the same function as defence against predators. The red-eyed tree frog is the meal of nocturnal hunters who can locate their prey with an exceptionally acute view. The shocking colours exhibited by this frog may over-stimulate the predator visual perception, creating a blurred image that remains engraved on the look while the frog jumps away. Despite their eccentric pigmentation, red-eyed tree frogs (rainbow frogs) are not poisonous. 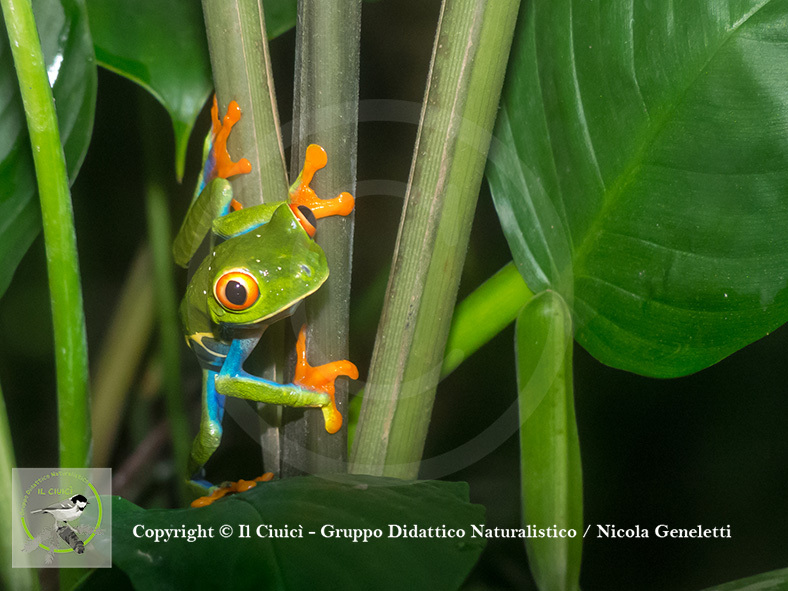 Agalychnis callidryas, amphibia, central america, eyes, frog, green, poison, treefrog.